Simon Henry Miner, also known as "Henry S. Miner," was born on Nov. 28, 1869 in Shelby County, OH, the son of Joseph and Mary Jane (Courtney) Miner. He apparently was named for an uncle, Simon Miner of Wood County, OH and is not to be confused with a cousin, Simon Miner of Trumbull County, OH. He was married at least three times, and once was pardoned of the crime of murder by Ohio Governor William McKinley, later elected President of the United States. Simon stood 5 feet, 6¼ inches tall, with light blue eyes, light brown hair and a common complexion. At the age of 24, on June 25, 1893, Simon married 17-year-old Phoebe "Ellen" Summerland (Jan. 2, 1876-1959), a native of Putnam County, OH, and the daughter of W. Richard and Samantha (Pettitt) Summerland of Riley Township. Their wedding took place in Putnam County. Their four children were Phoebe E. Miner, Ethel (or "Effie") B. Hipsher, Raymond Otis Miner and Victor Harold Miner Sr. Sadly, evidence strongly suggests that eldest child Phoebe -- named for her mother -- died young. Circa November 1895, Ellen and the children lived with her parents in Continental, Putnam County. Simon earned a living at the time as a "fireman" -- likely a job with the railroad. The mid-to-late 1890s were especially difficult for Simon and his mother and family, following the death of his father. 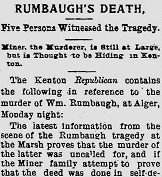 An article in a November 1895 edition of the Kenton Republican, reprinted in the Lima News, said "The Miner family bear a bad reputation among those who know them." It culminated in a murder in the fall of 1895 that landed Simon in jail at age 25, along with his mother and 17-year-old brother William. Their names were in the newspaper headlines for months. At the time of the incident, the family made its home near Alger and Lafayette, Hardin County, and in close proximity to the Allen County border. Neighbor William Rumbaugh apparently had lent a "50-cent stove" to the Miners. But when he said he wanted to reclaim it, and take it away, the Miners prepared for a fight. When he appeared at their home in early November 1895, a deadly brawl ensued. Simon told Rumbaugh that he wasn't going to get the stove, and that they would kill him. William pulled a revolver from his coat and said, "We intend to kill you and now is as good a time as any other." Neighbor William Stell took the gun away from William, but in the scuffle that ensued, their mother was knocked to the ground. Simon jumped on Rumbaugh, and beat him with a board, crushing his skull and inflicting a fatal hemorrhage. Said the Republican, "After Rumbaugh had received his death blow at the hands of Simon Miner, the mother and other son [William] sprang upon his almost lifeless body and beat him with clubs and a hoe handle." Daughter Lillie screamed, "Don't kill him, mother!" and Mary Jane replied, "Yes, I will kill the ---." Simon then escaped and was at large for several weeks. Sheriff Ranney pursued him in a horse and buggy through several counties -- first at Dupont, Putnam County, thence into Paulding County and back to Hartsburg, Putnam County. When he found that Simon had abandoned his own buggy and horse, and was now fleeing on foot, Ranney "then chased him through the big woods, where he lost track of him," said the Kenton News, reprinted in the Lima Times Democrat. The sheriff then searched the home of Simon's in-laws in Continental and learned that Simon had boarded a freight train for points unknown. "Sheriff Ranney had to come home, but expects to get him." The sensational news was carried statewide, with articles appearing in newspapers in Canton, Cincinnati and Cleveland. Mary Jane and William were arrested, and refused to tell authorities where Simon might be hiding out. While behind bars, Mary Jane received a letter from one of her married daughters, saying that Simon had been to her home. The letter also disclosed that Simon said he "was going to California, and would never be taken alive," said the Kenton News, in a story republished in the Lima Times Democrat. "Whether this is a ruse or not of the murder is a question." Simon finally was captured in the town of Dupont, Putnam County. He was taken to prison in Kenton, the county seat of Hardin County. The case went to trial in February 1896. A jury convicted Simon and his mother of manslaughter and sentenced them to 10 years of hard labor in the state penitentiary in Columbus. Brother William was acquitted. Mother and son both entered the penitentiary on Feb. 15, 1896. While in prison, Simon's appearance was described in writing by Ohio officials: "Forehead medium high + well back at sides: Brows slightly arched + apart: Ears very large + stand out: nose medium + straight + slightly turned up: Chin large + round: well build face slightly pit marked: small cut scar right cheek: cut scar right side upper lip: cut scar 1st joint right thumb: cut scar 2nd joint right index finger cut scar hick of left thumb: cut scar knuckle joint left index finger." In his habits, he was listed as "temperate" and in his education "common." Prison officials also noted that his family included "wife Ellen, Rise P.O., Putnam Co., Ohio. Bros, Wm. + Harrison: Sister Maggie: Rise P.O., Ohio: Sisters, Josephine, Elizabeth, Martha, Lillie." The mother appealed her case, claiming that the entire incident had been in self-defense. Less than two months later, on April 7, 1896, her conviction was reduced to assault and battery, with her sentence reduced to three months in jail. Simon's appeal was a different matter, as he had been the primary aggressor. 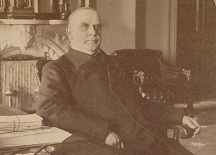 His case made its way to then-Ohio Governor William McKinley. In a remarkable turn of fate, McKinley allegedly issued a pardon, although this point is now in doubt. But Simon received his parole in Columbus on Feb. 2, 1898, and was released three days later, after having served two years of his sentence. The Miners stayed in Columbus after his release, and they made their home in 1900 on Goodale Street. Simon's name was listed on the federal census that year as "Henry S." and his occupation was "machinist." On June 14, 1902, with the Miners now back in Continental, Putnam County, a final release document was sent to their home by Ohio authorities. Sadly, Simon and Ellen separated in about 1910, after 17 years of marriage. He went to live in Michigan to live with his married brother and sister in law, William M. and Eliza (Smith) Miner, in Kalamazoo, Kalamazoo County. The census enumeration of 1910 shows the 40-year-old Simon in his brother's home, and employed as a foreman in an electric company, while brother William worked as a laborer in odd jobs. Ellen and the children, on the other hand, lived in 1910 on Ash Street in the town of Continental, with her name written by the census-taker as "Febie E."
Ellen pursued her husband for financial support for herself and the children. In April 1911, having finally located Simon in Michigan, the Sheriff of Putnam County wrote to Sheriff Campbell of Kalamazoo, asking for help in arresting and extraditing Simon to Ohio. Patrick Burns, a deputy sheriff in Kalamazoo, complied and took Simon into custody. "When arrested he was at work for Abe Green, a rag dealer on Ransom street," reported the Kalamazoo Gazette. "He made no resistance when approached by the officer. It is thought he will return to Ohio to face the charge without demanding requisition papers.... He is said to have been gone from home over a year." Simon married for a second time, on Feb. 24, 1913, at the age of 40, to 20-year-old Ida Dole (1893- ? ), daughter of Cornelius and (?) (VanderVeen) Dole. Kalamazoo municipal justice Glenn R. Faling officiated, with Simon's brother William and friend George Williams as witnesses. Simon was twice Ida's age. Simon's occupation that year was "foreman." In reporting the incident, the Gazette said that prosecutors were looking into the possibility that Simon had been convicted of murder in Iowa some 10 years earlier, had been paroled after two years, and that this latest felony was in violation of his parole. In a jury trial on Oct. 8, 1913, he "was convicted in ten minutes," said the Gazette. He was incarcerated in the Michigan state prison at Jackson. At some point in the 1910s, Simon was released from prison and returned to Kalamazoo. He resided in the "east side railroad district," reported the Gazette. In the winter of 1918, he was arrested for stealing coal, with the Gazette saying tongue-in-cheek that he "wanted just enough coal to tide him through the balmy spring months." The marriage between Simon and Ida did not survive the decade of the 1910s. He wed for a third time, at the age of 45, on Oct. 29, 1920, to Ada (Wallace) Hord. She was age 36 and the daughter of Charles and Alice (Jupp) Wallace. It was a third marriage for both. Probate judge Samuel H. VanHorn oversaw the ceremony in Kalamazoo, with Carleton Newton and Gertrude Koolman serving as witnesses. On the marriage license, Simon disclosed his occupation as "cook." Within a month of their marriage, Simon and Ada had a run-in with the law, on Nov. 19, 1920. One of Ada's acquaintances, Edna Nichols, filed a complaint against them, saying they had "Assaulted and grievously injured her by beating and striking," reported the Gazette. Simon told a news reporter that "before he and his wife were married she roomed with Miss Nichols and that the latter took some of the things belonging to he new Mrs. Miner." A municipal court jury found Ada, but not Simon, guilty as charged. Simon accepted occasional part-time work with the railroad, but in February 1921 was out of work for two-and-a-half months. He told a judge that his "only source of income at present is what he earns playing for dances once a week. He is living with his brother..." After just four months of marriage, he and Ada separated. She sued for divorce, and alleged that he took $60 of her funds when he left home. In a court appearance before Judge George V. Weimer, Simon admitted that he "hasn't had much luck in matrimony, as his third wife is now suing him for divorce, his first wife having divorced him, while he secured a divorce from his second wife," said the Gazette. In the mid-1920s, Simon is said to have taken a job as a railroad foreman or detective in Kalamazoo. Tragically, on June 12, 1926, at the age of 58 years, six months and 23 days, he is said to have been shot and killed by train robbers. On his official Michigan death index record, the cause of death as appendicitis and general peritonitis -- possibly a kind way of saying he had been shot in the intestines. This all needs to be confirmed. On the death record, Simon's marital status was disclosed as "widowed." The remains were laid to rest in Kalamazoo's Riverside Cemetery, in Section RR, Lot 529. More of this horrific act will be added here when learned. Ellen married again within about a year after her divorce from Simon. On Jan. 2, 1912, in Continental, she wed 35-year-old carpenter William L. Meyers (1876- ? ), the son of D.S. and Mary (Boggs) Meyers (or "Myers"). On her marriage license she listed herself as "divorced." The marriage apparently did not endure, and they divorced. During the 1910s, Ellen moved to Toledo, Lucas County, OH, and again carried the name "Miner." The census of 1920 shows her heading a household on Canada Southern Avenue, including her son and daughter in law, Raymond and Mary Clara Miner, and younger son Victor H. Miner. The census-taker marked the 44-year-old Ellen as divorced. To generate income, Ellen was employed as a machine operator in an automobile company, while Raymond worked for a coal company as a "helper on truck." There in Toledo, and under the name "Ella Miner," she wed her third husband, 39-year-old Frank Ridenour (1881-1941). He was the son of Enos (or "Elnos" and Binaca (Harter) Ridenour of Paulding County, OH. The wedding took place on April 17, 1920, with James Austin Jr., a judge of the Municipal Court, officiating. Frank's Ridenour relatives were Ellen's next door neighbors in Toledo, so perhaps that is how they met. At the time of marriage, Frank lived at 1423 Woodruff in Toledo, and worked as a foreman. He moved into Ellen's home at 3944 Canada Southern in Toledo. The Ridenours enjoyed more than two decades of wedded life. Suffering from heart disease, Frank passed away at the age of 60 on July 1, 1941, in Toledo. He was laid to rest in Ottawa Hills Cemetery. Ellen married for a fourth time to Samuel Champaine ( ? - ? ). They made their home in Toledo at 3944 Canada Southern Avenue, where she had spent her entire life after moving to Lucas County. In the autumn of 1958, as her health declined, she went to reside with her married daughter Ethel Hipsher of near Edison, Canaan Township, Morrow County, OH. She died in the Hipster home at the age of 83 on Jan. 6, 1959. An obituary in the Marion Star said that she "had been ill for nine months and was living with her daughter since November." Her remains were placed into rest in Ottawa Hill Memorial Park in Toledo. 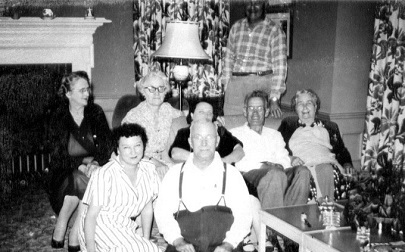 Simon's adult children -- front: Lucille (Schuler) Miner, Sam Champaine. Second row, L-R: unknown, Ethel Hipsher, Mary (Snyder) & Raymond Miner, Ellen Champaine. Standing: Victor H. Miner. Daughter Ethel Blanche Miner (1896-1988) was born on May 25, 1896. On Oct. 24, 1914, when she was age 18, Ethel married 19-year-old Elmer Lloyd Hipsher (1895-1973). He was a farmer and the son of William M. and Rosa "Belle" (Queen) Hipsher. Justice of the peace Charles E. Gompf performed the ceremony in Marion County, OH. They had at least two children, Robert William Hipsher and Vivian Belt. They made their home for many years in Canaan Township near Marion, Marion County, OH, on Sexton and Hatcher Road. She was a member of Denmark United Methodist Church and was a volunteer with the Ladies Aid Society and a charter member of Canaan Grange. Elmer died on June 5, 1973, ending their marriage of nearly six decades. As a widow, Ethel made her home along West Marion Road in Mount Gilead. Toward the end of her life, Ethel was admitted to Woodside Village Care Center in Mount Gilead. There, she passed into eternity on May 15, 1988. Funeral services were conducted by Rev. Mary Lou Compf, with interment in Worden Cemetery near Denmark. An obituary was published in the Marion Star. Son Robert William Hipsher (1915-1946) was born on Aug. 22, 1915 in Marion County. He married Mildred (?). He was a farmer and resided in rural Galion, Morrow County, OH. Plagued with a habitual use of barbiturate use, he took an overdose in February 1946, and three weeks later he died, on Feb. 24, 1946. He was laid to rest in Caledonia Cemetery in or near Galion. Daughter Vivian Hipsher (March 17, 1917-2017) was born on St. Patrick's Day 1917 in Marion County. She graduated from high school in 1934 and took two years of classes in court reporting at LaSalle University. When she was 19 years of age, on April 11, 1936, she was united in holy matrimony with William "Scott" Belt (1908-1995), son of Jacob M. and Mae L. (Postle) Belt. They remained together for more than 58 years until the Grim Reaper severed their union. The couple produced these children -- Michael Belt and a daughter who died at birth on Feb. 28, 1945. From 1955 to retirement in 1980, she was a court reporter for the Court of Common Pleas of Morrow County. She was a member of the Denmark United Methodist Church, which, said the Morrow County Sentinel, "she attended since she was two years old." Vivian also was a charter member of the Canaan Grange and belonged to the Homemakers Club, Business and Professional Women's Association, Morrow County Republican Women and Red Hat Society. She unwound from her busy life by sewing, knitting and playing cards. Scott attended Marion Business College and was employed as clerk for the Morrow County Commissioners from 1937 to 1941 and then served as clerk of courts for Morrow County for 24 years, from 1941 to 1965. In 1965, he was elected as an Ohio legislator and, concluding his term in 1967, joined the office of Auditor of Ohio where he worked until 1971. From there, while maintaining a farm, he was elected as a Morrow County Commissioner and served from 1971 to 1975. In the community, he held the offices of president and lieutenant governor of the Mount Gilead Kiwanis Club. He also was named to the board of directors for Peoples Bank in Mount Gilead. At one time he was named in Who's Who in American Politics. The Belts lived along Township Road 60 in Edison, OH in 1988. Sadly, Scott passed away in Tucson, AZ on March 21, 1995. His remains were returned to Ohio for burial, officiated by Rev. Howard Huston. Vivian outlived her husband by more than two decades. As she aged, she began to suffer from dementia. She was admitted to Bennington Glen Nursing and Rehab in Marengo, OH, where she succumbed on Jan. 21, 2017, just two months shy of her 100th birthday. Interment was made in Claridon Cemetery, with Chaplain Jeff Slider leading the service. An obituary was published in the Sentinel. Grandson Michael L. Belt ( ? - ? ) was born in (?). He married and produced two children -- Lori Myers and Christopher Belt. In 2017, Michael made his home in Edison, OH. Son Raymond Otis Miner (1899-1973) was born on Jan. 15, 1899, in Columbus, Franklin County, OH. As a young man he lived in West Toledo, Lucas County, OH, where he was employed as a laborer. 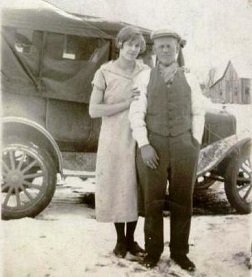 He married Mary Clara Snyder (1901-1976) on June 14, 1919, when he was age 20 and she 17. Mary was a native of Bono, OH and the daughter of Wallace and Julia (Rabar) Snyder, and also was making her home in Toledo at the time. For the first few years of marriage, they lived with Raymond's mother in Toledo, on Canada Southern Avenue. They had seven children -- James "Jim" Miner, Harold Miner, Mary Lou Miner, Larry Wade Miner, Raymond "Bud" Miner, Lucille Katherine Miner and Dale Miner. Raymond died in Toledo at the age of 74 in April 1973. Mary followed him to the grave three years later, in 1976. Son Larry Wade Miner wed Nellie (?). Their four children were Betty Jane Miner, Larry Joseph Miner, Rebecca Miner and Raymond Miner. Daughter Lucille Katherine Miner (1920-1994) was born on Feb. 29, 1920 (Leap Day) in Toledo, Lucas County. She married Arthur C. Gatter (1917-1975). Arthur passed away in 1975. Lucille died in Texas on Aug. 5, 1994 at the age of 74. Left to right: Lucille Miner, Ellen and Sam Champaine, Victor H. Miner Sr. 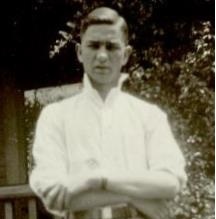 Son Victor Harold Miner Sr. (1907-1965) was born on April 20, 1907 in Pennsylvania. At the age of 23, on New Year's Day 1931, he married 21-year-old Lucille Schuler (1910-1974). She was the daughter of Adolph and Rose (Bolles) Schuler. The wedding took place in Lucas County, OH, officiated by Rev. Grant W. Speer. Victor's address at the time of marriage was his mother's home at 3944 Canada Southern Avenue in Toledo. They made their home in Sylvania, OH and had three sons -- Victor Harold Miner Jr., Gary Ray Miner and Michael Allen Miner. He died at the age of 57, in Toledo, Lucas County, OH, on March 26, 1965. Lucille survived her husband by nine years. She passed away in 1974 at the age of 64. Son Victor Harold Miner Jr. (1934-1973) was born on Feb. 9, 1934. He was married and had five children. He died on Aug. 26, 1973. Son Gary Ray Miner (1936-2006) was born on April 17, 1936. He married Mary Jeanne Postle ( ? - ? ) and had a family of three children -- Bradford Ray Miner, Rodney Elwyn Miner and Rebecca Ann Miner. He died on June 2, 2006. Son Michael Allen Miner (1945-2018) was born in 1945. He married Mary Louise Peotrowski ( ? - ? ). They produced three children -- Jeffrey Miner, Heather Parris and Randy Miner. Later, in about 1988, he wedded Shelley Ross ( ? -living) and had three more offspring, Teresa Hopkins, Wendy Kiser and Mindy Hopkins. The Miners made their home in Sylvania, OH and Bronson, MI. Michael joined the Sylvania Township Fire Department in 1975 and was a member until retirement in 2000. He served as president of Sylvania Firefighters Local 2243. He also enjoyed spending time on Matteson Lake and sailing on Lake Erie. Sadly, Michael died at home at the age of 73 on May 2, 2018. Granddaughter Teresa Hopkins wedded Dale Vanderford. Grandson Jeffrey Miner was joined in wedlock with Tammy.